M Chan loves his Nana. Well, if this isn’t just the cutest picture EVER! Alison, Nana’s Granddaughter, sent this photo after the festivities… if you remember, Nana the birthday girl for whom M Chan’s Animal Print was ordered just celebrated her ninetieth birthday. YES, this pic is from Nana’s 90TH birthday! Isn’t she pretty?! 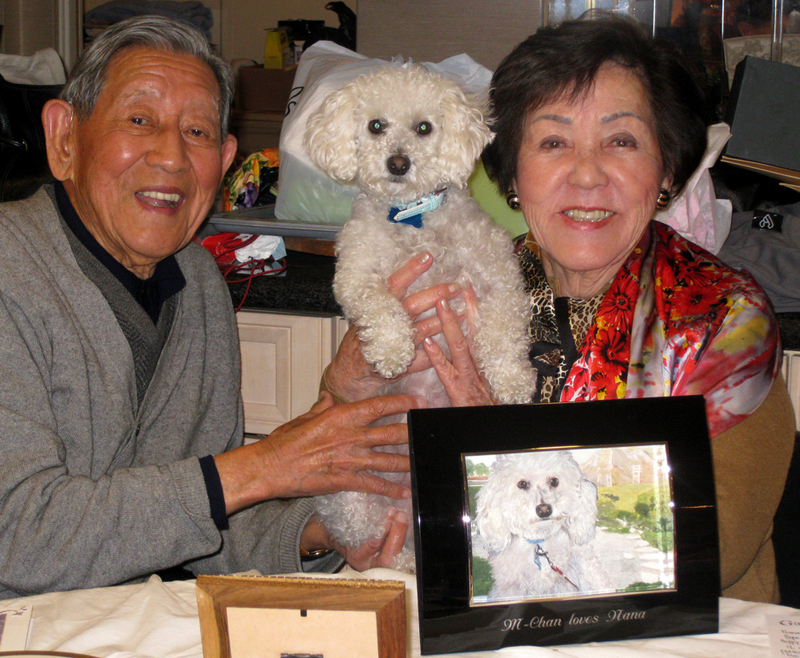 If happiness is the key to longevity, we look forward to hearing how Nana and Gramps celebrate their first century! “I love the tribute to M-chan 🙂 The painting turned out incredible! And I just want to say on behalf of Nana and my family, THANK YOU! It was such a great hit during the present-opening segment of the evening! I’ve attached one of the many pictures I took of Nana opening her gift. With much appreciation, Alison.” Thank you Alison for your kind words, and keeping me posted. I’m so happy to have been a teensy part of your family’s very big day. *A keen eye will notice the frame engraved especially for the occasion, “M Chan loves Nana.” Now that’s Gadorable. Posted on January 15, 2010 January 15, 2010 by gadorawilderPosted in ANIMAL PRINTSTagged animal print, Poodle, water color. Previous Previous post: Gus and Codi sit pretty.